With the stewards having decided that Hamilton's driving behind the pace car in Fuji deserved no penalty, sanity returns to F1 and we can get back to racing. The practice sessions produced no surprises, the usual four playing musical chairs with the best times, BMW slow, as they like to be on the first day, and Toyota and Red Bull flattering to deceive. 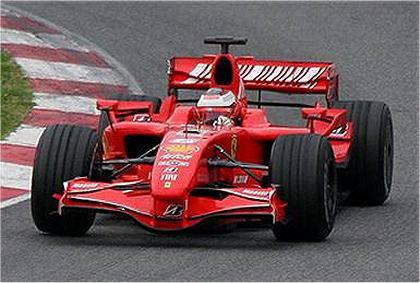 But Ferrari do not have the expected advantage, in spite of Raikkonen being top of the time sheet. Times were extremely close, a mere two tenths of a second separating the fastest and fourth best times. The intense struggle between the two warring teams will continue on Sunday, it seems. More interesting than the speed of the Red Bull duo (Webber sixth, Coulthard 8th) is the comparison with their sister team, Toro Rosso. Mid season STR were extracting a very similar performance from Adrian Newey's chassis as were Red Bull; but lately they have slipped badly while RBR have improved. Forget Vettel's speed in the wet in Japan - his 21st fastest time in practice in China is a much more accurate reflection of STR's competitiveness in the dry. While RBR battle to lead the midfield, STR try hard not to be beaten by the Spyker 'B' spec car in Sutil's hands. Renault, Honda and BMW have grouped their times rather nicely but Williams still have the problem of a very quick driver making the other look slow. There was only a second between Rosberg's and Wurz's times but that translates into the difference between ninth and sixteenth spots. Nico has been urging Sir Frank to keep Wurz as the second driver so it may well be that he understands the real value of the Austrian to the team and doesn't want to lose his set up abilities. I believe that was always Frank's intention in elevating Wurz to race driver and that it was not expected that he provide an extra return in race results. The pressure on Wurz has come entirely from the media as they saw that he could race well but was handicapping himself by poor qualifying positions. In fact, Alex has done an excellent job in helping to develop the car and the few points he has scored have come as a bonus. Would Williams benefit from having a second driver as quick as Nico? McLaren's experience this year has cast doubts upon the wisdom of having two number one drivers and even Ferrari's similar policy has resulted in their drivers taking points away from each other. It all depends on which championship you want to win. And Frank has always cared more about the contructor's than the driver's, so the likelihood is that he and Wurz have agreed on a development role for him while Frank finds a paying driver to fill the second seat and back up Rosberg. But I digress. Returning to Shanghai, it seems that a typhoon may be headed in the direction of the circuit and we might have another extremely wet race as a result. We have all been begging for rain to interfere with the processional races of this season and now it looks as though our prayers are being answered all at once. If the rain comes, along will come the controversies too, no doubt. It's an exciting business, this Formula One! Yes, Nico seems to be what so many of the new generation of F1 stars are not - mature and sensible enough to lead a team to success. There is far too much selfish consideration only of personal glory in some drivers and the teams too often given lip service but ignored in reality. Rosberg and Wurz have made a great team. Incidentally, Alianora, I notice you commented on Ollie's post on customer teams - I have answered there and would be interested to see what response you might have. What is Massa qualifies near The Ham, do you think he would purposely take the two out (accidentally of course) in the hopes of keeping Kimi's championship alive? This would also help Alonso but it would be the lesser of two evils in Ferrari's eyes. I don't think too many drivers would sympathize with him if he was unfairly taken out. You could penalize Massa obviously, but not Kimi so there would be no risk of it interfering with his chances, at most the team would be punished but that is doubtful. Actually, I don't find it that far-fetched, Dan. Lesser things have been done in F1. I'm glad Dan M qualified his senario as "far fetched" and that it is ....... Massa isn't going to "take out anybody". He may how ever be a spoiler by winning the last two races, how's that for "far fetched"? Hey we're all havin' fun, eh? I meant that it isn't unheard of for one F1 driver to take another off when it suits him, Number 38. Didn't mean to imply that it is in Massa's nature to do that. But will he be "allowed" to win the next two races? I can't speak for Massa but if I were in his shoes and Kimi were running well, I'd help him, after all Massa's suspension failure at Monza set him back enough that he is in reality out of contention, there's no reason NOT to help Kimi and every reason NOT to block if leading Kimi. It doesn't take "team orders" to figure that one out. If Kimi ends up a DNF at some point Massa may try to "race" Alonso or Hamilton if only to prove the point he can! On the other hand he could just cruise around and hold position, 5th place can't catch him either. For Massa (and many of us) the season is already over. Very true, Number 38 - just a few points left to prove. There's Ralf has to make a last bid to show he's still got it, and Vettel to demonstrate that he has it in him to beat Liuzzi. Red Bull would like to catch Williams, no doubt, and perhaps Sutil and Toro Rosso could both score a point instead of squabbling over the only one going. And maybe Honda could get a point or two look a bit more respectable.